- Stumbled upon just for trek information/details?? Simply scroll down and go to the end, you shall find it. 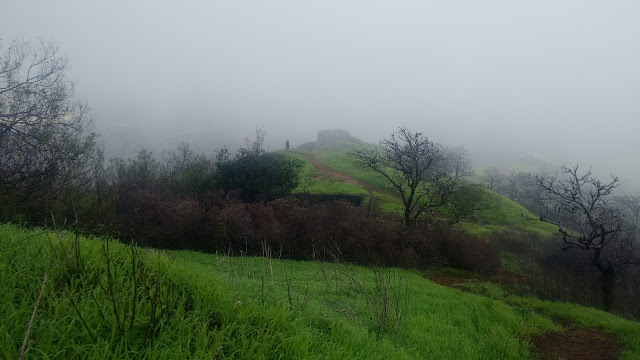 Here to the start of season’s first monsoon trek; A trek which I have been waiting and wanting for more than a year now. But this time things were lil different. Am mostly a solo bagpack explorer, however for this trek I joined a wonderful group “Trek and Trails” for this amazing overnight expedition. Was desperately waiting for monsoons to knock my door but rain Gods were in no mood to oblige. 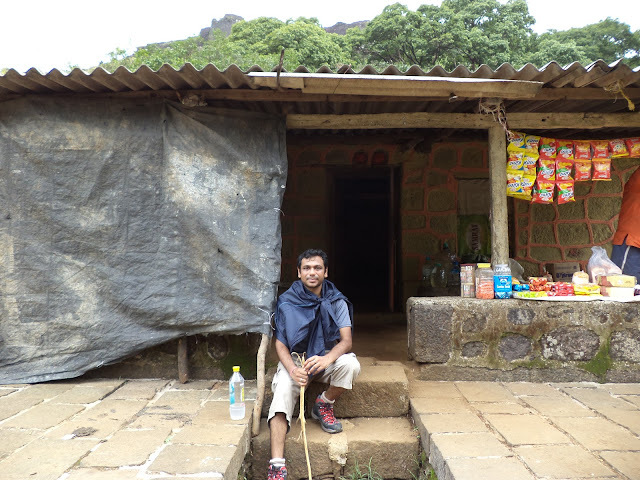 While scorching heat of Mumbai was draining away my energy and zeal, I happened to stumble upon my fellow entrepreneur, a big time trekker Anand’s FB post which had mesmerising pictures of mountains with fogs and rains of Matheran in the background and Anand sipping tea, posing in from his tent. That was the last nail in my coffin and I decided - Rains or No Rains….dude am going. Reached the meeting point at lonavala station, found few similar dressed-up guys/gals and it took no time for me to realize these are my Trek buddies for 2 days. The first guy I interacted with was Shivam, an IIT KGP student interning in some company at Pune who reached Lonavala 2.5 hours before the scheduled meeting time. Must say, Super Enhu wala Launda. 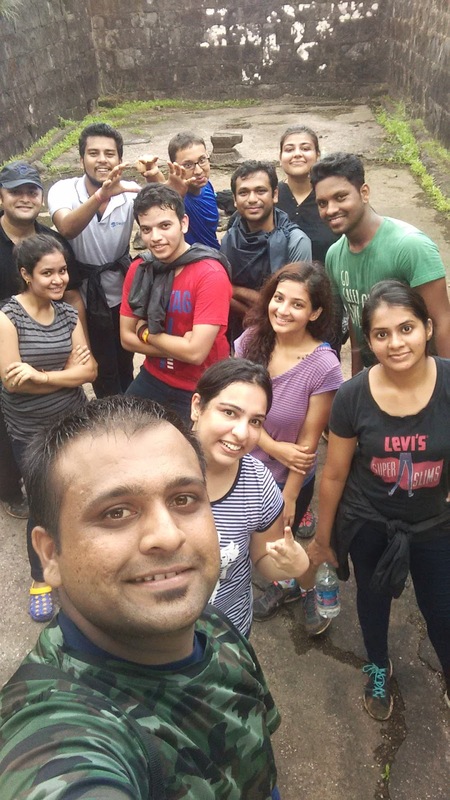 It was a mixed group of students & working professionals; boys & girls; First timers & usual trekkers. Our trek guides Rajesh and Prasad gave us 10 min to do whatever we want before we start our journey. It started raining heavily at lonavala, Shivam and I grabbed a cuppa hot tea, bought few extra sets of batteries while others were busy collating their stuff and satisfying their hunger. With tons of excitement we all started ascending towards base village, it was pitch dark and only life saving instrument was our torches. Because of dark night we were not able to see though the landscapes much but that didn’t lowered our zeal to march 17Km. Chitting & chatting, laughing & singing and knowing each other while marching we were enjoying our journey. Halted at few points to be in sync while loading ourselves with food that we carried in our bags. Meanwhile at every 15-20 mins we were replenishing our energy with water/GluconD/Enerzal or whatever. 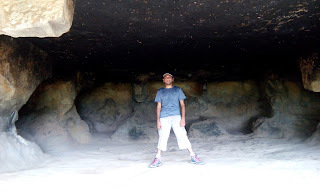 Kaustubh aka “Go Pro wala” was busy in taking pictures and videos whatever he could manage to capture at night. 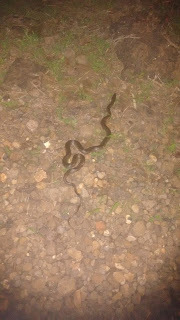 And then we encountered few deadly snakes on the way. People started screaming “Mummy“ “Mummy” (in fear or ummm may be excitement) Meri bhi faat li Boss. 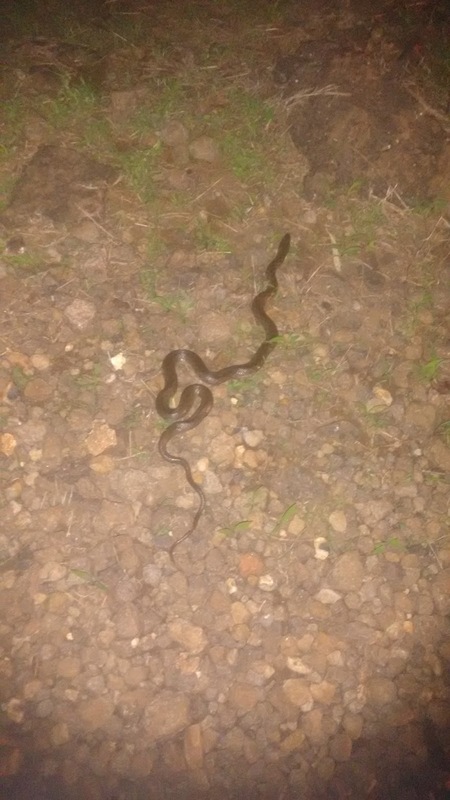 The one thing am dead scared of are snakes. Gosh… We survived, torch saved us. I screamed at the guys “Cheedo maat usse ..… jaane do” and it slowly went in to the wild after lot of halla bol. We thanked God and the Snake of course and further moved on. 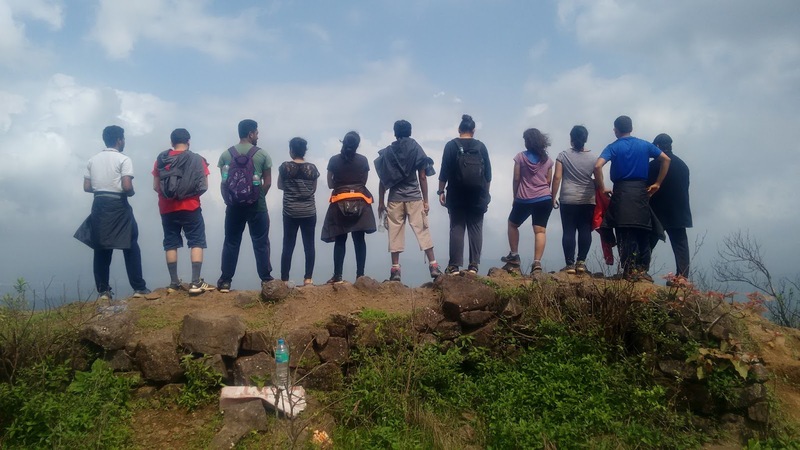 Carrying each other along, caring for fellow trekkers, extending helping hand to cross the slippery muddy path, overcoming this reptile fear in the darkness, motivating each other to keep moving created a great bonding among erstwhile strangers. I talked about my previous deadly yet amazing treks and my next year’s plan for The Mt Everest Base Camp, Prasad shared his mountaineering experiences and we reached Rajmachi Base village at 11:00 PM. Our stay was at one of the house in the village where we crashed dead tired. To make the group lil more interactive Prasad took an initiative and we started our introduction again (in detail this time) After freshen-up, we all hungry bunch of people attacked the lip smacking food followed by Sewaiyyan (my favorite), all local Maharashtrian cuisine made with lot of love by the villagers. After food, few guys moved out for a walk and rest of them retired to bed in a dormitory style next to each other creating more bonding and intimacy. LOL again. However, there was this notorious yet happening another group next to our base singing and dancing till 3 AM; making us sleep deprived. But we managed to, at the end. 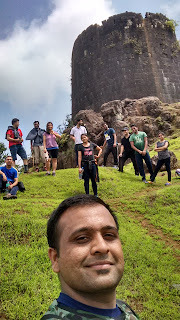 Encountered few dreadful snakes, notorious monkeys and mongoose on my way to the top. They were like “Gotcha alone, it’s our time now to screw you buddy” Hehehehe… In between, there was a beautiful old Kal Bhairov Mandir that was actually a common assembling/originating point for Shrivardhan and Manaranjan Fort, however both the Forts have different routs from here. I took the Srivardhan route first. Our Trek Guides Prasad & Rajesh were happy to see me finally and Prasad decided to walk with me this time eliminating any further chance of detachment. 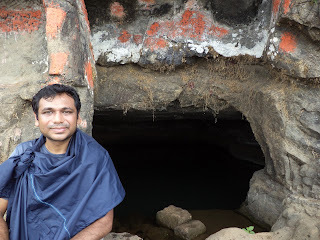 Shivam filled his bottle with Fresh Mountain water from a cave and we moved on. 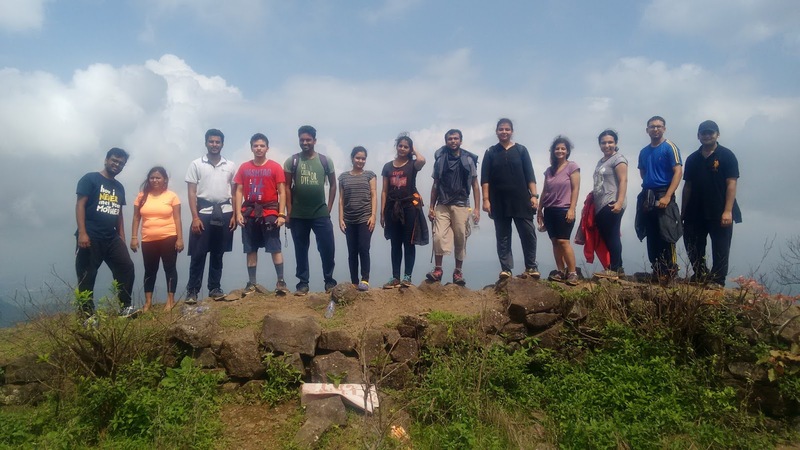 After enjoying the moment up there, we all descended to Kal Bhairao Mandir, relaxed there and refueled ourselves with Lemon Water. Out of 25 people, we 14 (Dare Devils OR Special 14) decided to trek to Manaranjan Fort as well. Rest of the guys decided to rest at the Mandir for sometime and then descend to the base village. Special mention for the girl - Mansi for making it all while she was dead tired after the first trek. Dead tired we descended to base village, relaxed a while, mingled with rest of the people and had local lunch including chowli and bhakri. 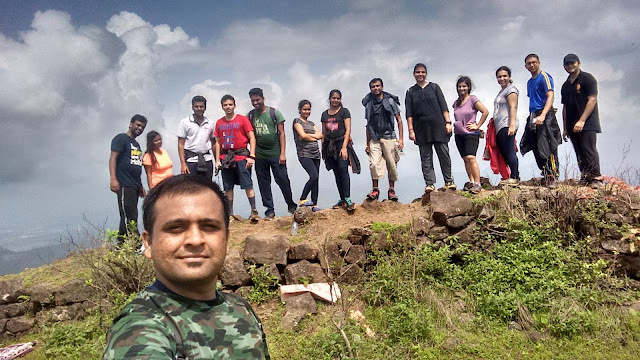 Now was the most difficult task to descend from Rajmachi to Karjat via Kondane. It was more than 5 hrs of tiring, dangerous, difficult and steep descend. We all bucked up and started the show. 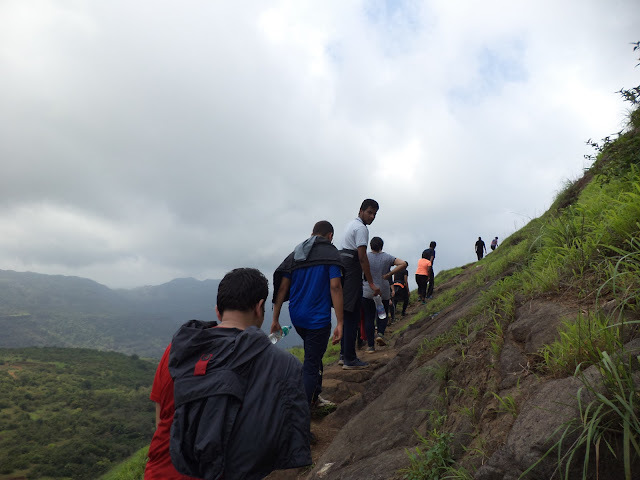 This descend witnessed few trekkers slipping here and there, crying in pain, overheard few of them saying this is my last trek, few cursing their fellow friends for bringing them on here and what not. Amidst all these, motivating each other, with few rest over stops to regain energy, we made to the Kondane Cave where we clicked pictures and then quickly moved on for Karjat as it was getting dark. Finally we reached the dropping point with pain, blisters yet big smiles on our faces and of course sense of achievement. From dropping point we left in TumTum to Karjat station and then dispersed after having Ganne ka Juice. 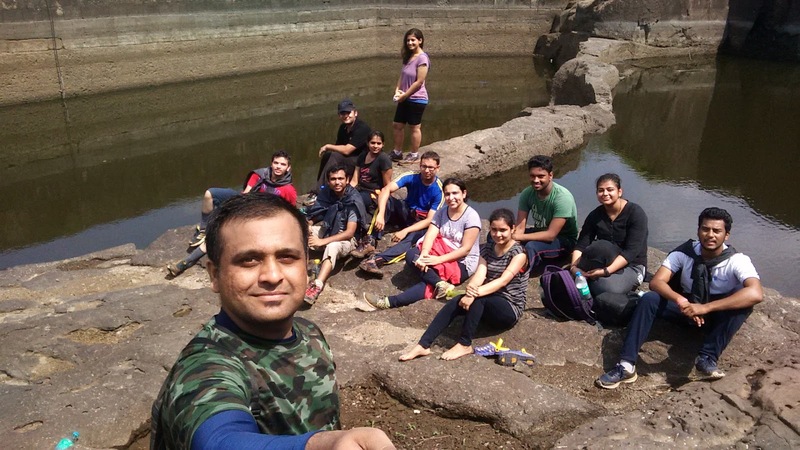 In this entire trek I really admire the endurance level of 2 girls namely Moulshri and Prachi. They were rockstars and were leading descend from the front. I got my 2 new trek buddies Shivam and Kaustubh for forthcoming treks. - If you can read Chetan Bhagat then definitely you can read this blog too AND if you don’t read him, why not give a try to this blog :p you won’t be that disappointed. - A bit lengthy read; being a storyteller, my style of writing is also more in a story/script format. I love describing every bit of the event because that’s what events and memories are for… right?? Making you Nostalgic and you wanna read it again and again. - Also, because I want my fellow readers to get engaged, relate to & feel the trip while reading up, as if they were a part of it already. Somewhere this may also motivate you to plan your trip with your loved ones or just GO FOR IT SOLO. - Take a train from CST/Dadar/Thane to Lonavala. Pune Guys can also take any train that stops at Lonavala. Its hardy 2 hrs each from Mumbai or Pune. 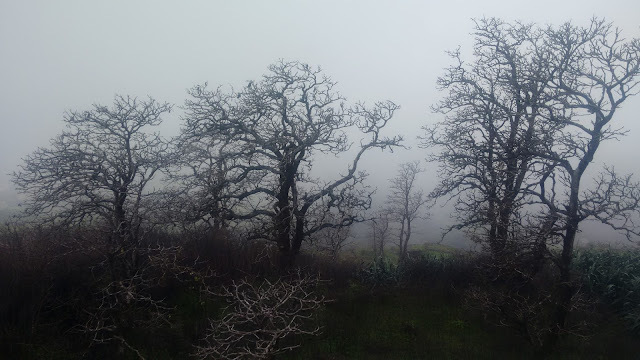 You may also drive down to Lonavala. - Lonavala to Tungarli is a motorable road and it is 3-4 Km from lonavala station. There is no parking at Tungarli though. 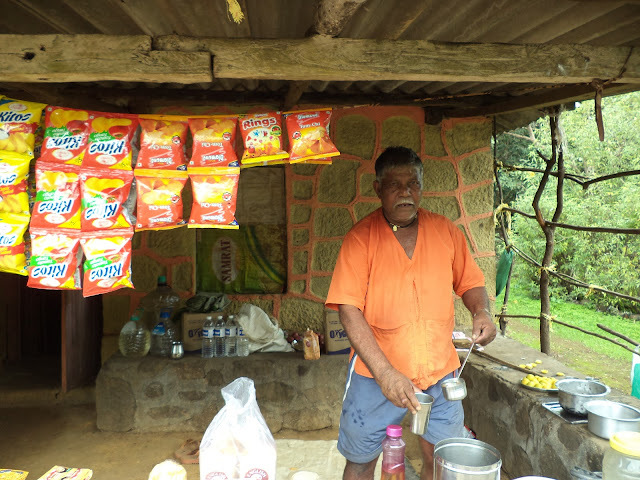 - You may choose to stay at Rajmachi village in villagers house at nominal cost including dorm bed and food. - You may choose to descend from Rajmachi to Lonavala if you are tired enough not to take Karjat trek route.